Should secondary schools be allowed to select, and if so, on what basis? These questions have long been a battleground of the English education system and have too often yielded answers that reduce the issue to oversimplified dichotomies. 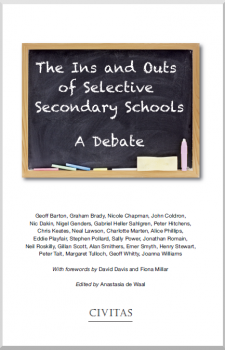 The Ins and Outs of Selective Secondary Schools: A Debate gathers a diverse range of key thinkers to evaluate the modern scope of secondary school selection in all its evolving complexity – including by ability, fee, faith and stealth. With authors including head teachers, politicians, academics, campaigners and commentators, the book incorporates a rich mix of practitioners’ testimony, research evidence on educational outcomes and analysis of consecutive governments’ policy, to scrutinise practice as much as principle, and to tackle both the contentious theory and realities of selection. In determining whether there is such a thing as ‘the right school for the right child’, the authors address whether we can promote social mobility without hiving off sections of society; who exactly selective secondary schools serve; and whether a system without selection is actually achievable, given the emergence of covert selection via the housing market. Setting these issues within the context of today’s educational and socio – economic landscape, The Ins and Outs of Selective Secondary Schools: A Debate ultimately guides the reader towards the bigger debate behind selection, namely about the dilemmas we face as a society in determining what it is we want to achieve through education. Peter Hitchens: Why Is Selection by Wealth Better Than Selection by Ability?